Summer hiking in Morzine (Pointe de Ressachaux) | Walking and summer adventure holidays in Morzine, France. By Ashleigh Hawthorne, Simply Morzine Chalet Host, Summer 2018. The mountainous backdrop of the French Alps is undeniably beautiful, and like most seasonaires, this was the main reason I chose to spend three months living and working in Morzine this past summer. Morzine is one of the most picturesque places in Europe, all year round. My boyfriend Tom, and I, arrived in Morzine at the start of June. We decided to work for Simply Morzine because we’d been on one of their summer family chalet holidays the previous year and had a brilliant time. We applied and got the jobs! After settling into our accommodation we enjoyed getting to know our new colleagues (soon to become great friends) and joining the Simply Morzine family. One of the first things Tom and I wanted to do when we had some free time was to suss out the local mountain hiking trails, in and around Morzine town. 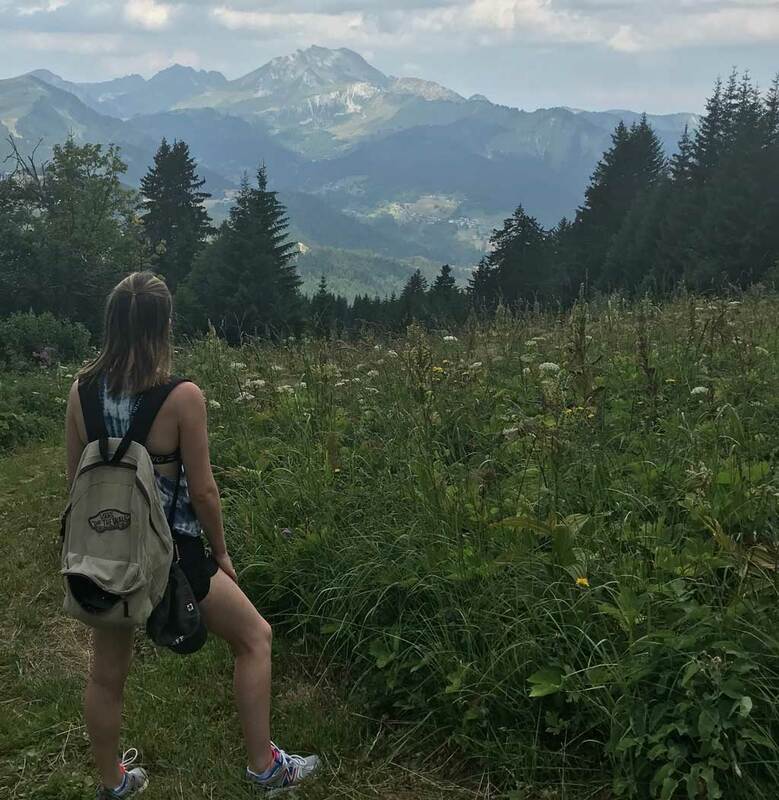 If you’re taking a holiday in Morzine during the summer, some of these big walks just have to be done and this would be my main recommendation if you ever visit Morzine in the summer. It’s well worth walking the Pointe de Ressachaux if nothing else, but it is a challenge as I hope my video shows! There are plenty of superb summer hikes for all abilities scattered around the Morzine valley. These can either be accessed directly from in or around Morzine – or via the two main lifts – Super Morzine and Le Pleney. Some of my favourite summer walks in Morzine include the stunning Nyon Waterfall and Lac des Mines d’Or trails. Both of these are pretty leisurely and take about half a day, with time to stop for a picnic or lunch at a mountain restaurant. We completed these no problem – and then we set our sights on the ‘Morzine 3 Peak Challenge’. This is an annual competition where all three of the mountains surrounding the Morzine valley (Ressachaux, Nantaux and Nyon) are climbed in one day – yes just ONE day!! This seemed a very cool challenge – but Tom and I aren’t exactly gym buffs – so we decided to make a mountain bucket list and tackle one at a time. With this in mind, Tom strapped on his hefty hiking boots and we set off to attempt ‘The Ressachaux’ as our first. 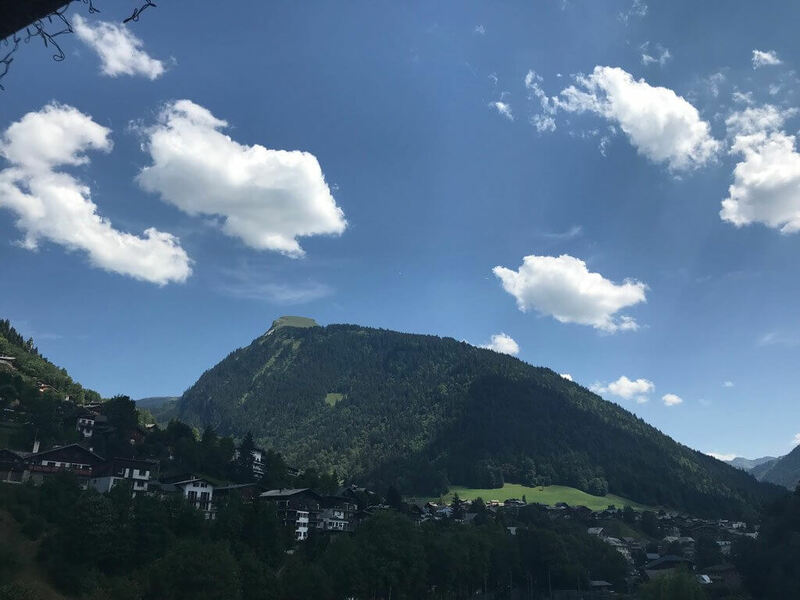 This is a well-known and imposing mountain, accessed from the edge of Morzine and sits impressively in full view of the Simply Morzine properties. Tom was interested in the tough challenge of tackling the Ressachaux mountain – whereas I more so in catching some amazing views up and out of the Morzine valley. As I suspected, after some pretty laborious climbs, the summer views on the way up – and especially from the summit – are truly breathtaking. As I hope you can tell from my video, climbing up the Pointe de Ressachaux was no easy feat – relentlessly steep from the very beginning and a gruelling slog all the way to the top. The total distance is around 7km, with a vertical ascent of 1160m. The first half of the climb was spent in the dense forest, making it hard to gauge progress, or how far we’d actually ascended. But once we’d broken through the trees and into the clearings, the panoramic views opened up. As we climbed higher and higher, more mountain ranges in the distance popped up and a miniature Morzine became visible below. I’ll never forget it. In total, from door to door, hiking up the Ressachaux and back took amateurs like us around 3 and a half hours to complete – and it was certainly worth the effort. With plenty of gummy bears to get us through, this climb (along with Nantaux and Nyon) have become my favourite memories of my incredible summer in Morzine. Working in Morzine certainly has its perks! Tom and I are now back in the UK but can’t wait to return to Morzine again soon on holiday.